(Nanowerk News) Around Earth, the processes accelerating electrons which hit the atmosphere and cause beautiful auroras are often initiated in thin current sheets. Similar processes, auroras and thin current sheets are found around other planets such as Jupiter and Saturn. Plasma regions close to the hot solar surface are separated by thin current sheets, and similar boundaries should also be common around distant stars. In man-made plasmas, thin boundaries are found in the tokamak plasma employed in nuclear fusion research and space observations may help us understand fusion plasmas. The solar wind blows plasma at the Earth’s magnetic field. This causes the so-called magnetotail, stretching several hundred thousand kilometres downstream from the Earth. There is a thin current sheet separating the northern and southern parts of the tail. In large parts of space, the plasma is too tenuous for the particles to actually collide. However, since the particles are charged, electric fields caused by some particles will interact with other particles. Often rather specific waves in the electric field interchange energy between the plasma particles. These waves replace ordinary collisions. The lower hybrid drift waves have been studied for 50 years and are thought to play an important role in these narrow current sheets. However, due to their relatively short wavelength, it has been impossible to observe their fundamental properties. IRF’s scientists have now, for the first time, been able to make direct measurements of the wavelength and velocity of these waves. It has not been possible to measure the wavelength with a single spacecraft, but this can be done with the European Space Agency’s four Cluster spacecraft. 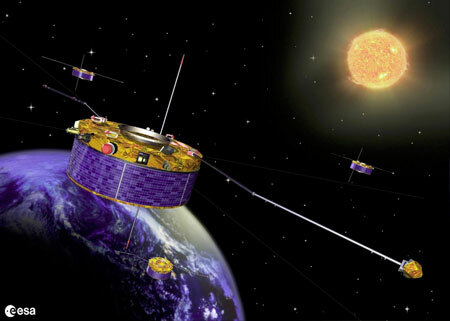 Taking advantage of the short 40 km separation between two of the four spacecraft in the magnetotail during August 2007, the scientists could observe the same wave propagating past first one and then the other spacecraft. The wavelength could be determined to be about 60 km (comparable to the radius of the electron gyro-motion in the magnetic field) and the velocity to about 1000 km/s (comparable to the ion velocity). The results appeared in the scientific journal Physical Review Letters on 31 July ("Lower Hybrid Drift Waves: Space Observations"). "We see small vortices that propagate in this narrow current sheet. They are just big enough so that both of the spacecraft can see them at the same time and be sure it is the same structure," says Cecilia Norgren of the Swedish Institute of Space Physics and a PhD student at Uppsala University. "The assumptions, used for several decades, have finally been verified by direct observations."